Thanks for coming by to check out the latest SHOPPING OUR STASH challenge!! 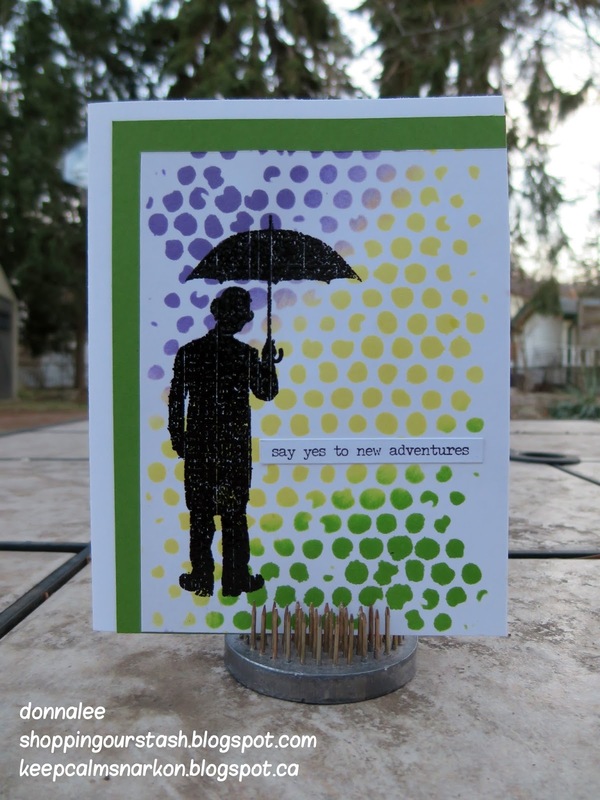 I went with traditional Mardi Gras colours for my card, purple, green and yellow. I've never been to New Orleans, but if someone invited me, I would "say yes to new adventures"
While you are there please share some love with the rest of the crew and our very special guest designer. Road Trip!!! Great use of the mardi gras colours, Fabulous card!! I think we had this convo before at soss, about us all meeting at Mardi Gras! We should so do that!!! Your card is all kinds of fabulous! Love the colors, and such a perfect sentiment! Excellent take on the Mardi Gras theme, Donna! Here I am stuck with a totally Mardi Grad NO tag... going to need to attach it to a bottle of something I guess, but you've used the traditional Mardi Gras colors in a universal way! Well done. Well I never knew that the Mardi Gras had traditional colours. Now I do. Love this card just so very different. What a fun way to interpret the challenge! Love the colours.